#thehappinessproject. Wow! Talk about a rewarding experience. This term I knew that I wanted to do another project that would allow me to include my students and looking back I can say I am beyond proud of the hard work and dedication my students (and families) demonstrated this term. Below I will outline for you our entire journey of the happiness project from beginning to now because the end hasn’t happened yet! 1.An idea and a plot twist: Originally I had planned to focus on teaching about digital citizenship by incorporating social media into our everyday classroom. I had an idea to use a classroom Facebook page where my students could learn about appropriate online behavior as I modeled for them throughout this term. You can read about my original idea here in my blog post Let’s do this! After some careful consideration, I just wasn’t feeling this choice was the right one and I felt like I was being pulled in a different direction. Along came my plot twist, with this I decided that I was going to launch a student activism project within my classroom. I shared my original idea with my classroom and let me tell you they were beyond excited. You can read about the beginning brainstorming sessions with my students here: Plot Twist… Major Project 2.0. 2. Settling on a project: after much deliberation and brainstorming sessions, we decided that we were going to do some exploration around the topic of happiness in our classroom. In honor of International Day of Happiness, we launched a happiness project to explore inner happiness. We decided that over the next few months, we were going to participate in daily activities that encourage mindfulness, self-regulation, self-care, gratitude, with the end result of finding internal happiness. During this time we talked about ways that we could share our project with others and how we can reach out via social media to invite and encourage other classrooms to follow along and participate in our project. We decided on a classroom blog as a way to document our learning and a place for others to follow along, participate and collaborate. You can find our happiness blog here! Our classroom blog is written by students who share their learning journey as well as updated with teaching resources by myself for these lessons so others can use them easily in their classrooms. You can read all about the fine details of our project at We present to you… The Happiness Project. 3. Ribbles 9 Elements: We were encouraged to consider how our project meets Ribbles 9 Elements of Digital Citizenship. You can check out my project goals and how I planned to teach my students about Digital Communication, Digital Literacy and Digital Health and Wellness through the happiness project. You can read about these goals in my blog post #projectgoals. 4. The Launch: After the February break, we hit the ground running. We launched our happiness blog, used my social media including Twitter, Facebook, and Instagram to reach out to other educators to see who would like to be a part of our project. Students also drafted an email to send out to any teacher who had expressed interest from my social media accounts. This email outlined our project and how they can follow along on our blog! You can find our happiness blog here! This is where my students shared and documented their learning. My students also narrowed down and picked their organization of choice. The students decided on the Make a Wish Foundation Saskatchewan. They picked this foundation as they wanted to spread happiness to a kid who may need a little bit of extra happiness. They decided to raise money for their cause by selling rainbow loom bracelets for International Day of Happiness. You can read all about the launch of our happiness project here at The Launch! 5. Getting Started: You can read about week one of the happiness project below! This outlines our happiness journals, our first few lessons as well as breaking the news to our school about our project in a school assembly! In this post, you will also find links to the updates on our classroom happiness blog for the first week! You can read all about our first week in the blog post #thehappinessproject is underway! Here is the video that my students created to share our happiness project with our school community at our assembly! 6.Feelings Week: Mid-March we focused on feelings for a week. We did several lessons around feelings. We also had Trina Markusson the Mindfulness guru come in to speak with our class about tips and tricks for mindfulness. You can read my blog post Feelings Week to see what lessons we did around feelings! This will also share the links to our happiness blog where you can read the updates from my students. 7. Charity: Students picked the charity Make a Wish Foundation Saskatchewan to raise awareness and money for. Over the course of a few weeks, students shared our project with all of the classrooms in our school and shared how students can get involved by purchasing a happiness bracelet for International Day of Happiness to support our cause. The school community was so excited about this fundraiser. Our students worked so hard to make and fill all of the orders for our school. We even had orders from other classrooms around the province that were following along with our project! That was very exciting for our students to have other schools also purchase for our cause! One of the students in my classroom also went above and beyond doing her own personal fundraiser for our cause. You can read the blog post Giving to Charity Makes us Happy to see how we prepared and fulfilled our fundraiser! 8. Mindfulness: Building on Trina Markussons presentation we spent a few lessons looking at working on ourselves. You can read the update about these lessons as well as find the links to my student’s reflections on their happiness blog about these lessons. You can read about this at Working on Ourselves. 9. #thehappinessprojectyqr: Using social media I was able to reach out to someone within our community that has branded #thehappinessprojectYQR. I reached out to Makayla to see if she would come and speak with our classroom about how she uses social media in a positive way to spread awareness about happiness. You can read about how we reached out to Makayla and our afternoon spent with her at #thehappinessprojectyqr. Over the past few months, we have accomplished so much with this project and I am so proud of the direction that it took. My class was able to spread awareness about self-care, self-regulation, mindfulness, and gratitude. They were able to use the classroom blog as a platform to share with others from outside our school community. They were so excited when others would comment on our blog and let us know that they are following along with our journey. I feel that this update is just a snippet of what we actually accomplished over the last few months! Students worked so hard to make all of the bracelets that we sold to our followers. These bracelets were sold to raise money for the Make a Wish Foundation Saskatchewan. It was such a great way to raise awareness for both our foundation as well as International Day of Happiness. The school was excited and it was so amazing to see all of our students united in wearing their bracelets on March 20th to show their support for our cause! Our fundraiser was beyond successful. Although this total is still a top secret from our school until our April Assembly check out the photo below to see how successful our classroom was in our fundraiser! Shhh… don’t spill the beans! We gratefully raised $1500 for the Make a Wish Foundation Saskatchewan. We are blown away by the support our classroom received from our school community as well as our followers for this project. We are extremely excited to share this with our school at our April assembly and then proceed to make our donation to the Make a Wish Foundation. Throughout this project, the most rewarding experience for myself has been to watch my students blog about their learning and the fundraiser. Allowing my students to reflect on their learning on a public forum has empowered them to dig deeper into their learning and share their work to inspire others. We had a class discussion about the benefits of using social media to share our work and they felt very proud that they could use the blog to share happiness with others. They shared how if we didn’t have our blog our learning and ideas would have just stayed in our classroom but because they put their work on the blog they were able to share happiness with others. This was extremely powerful. All in all this project was extremely rewarding and I am excited to share that we are not finished yet! We have moved on to celebrate Grateful in April which is a great way to wrap up our project. We are extremely grateful to everyone who followed along and supported us along the way. Thank you to all who took the time to read our blog and comment for my students to see that their work has gone public! This was by far their favorite part. Also, thank you to any teachers who tried some of our activities in their classrooms as well as supported our fundraiser. We are beyond grateful. I feel like this project is hard to wrap up and summarize in one blog post. Please head over to our Happiness Blog which can be found here! This is where the true happiness lies and you can see the full scope of how much work my classroom did over the last few months. Make sure to subscribe because there is still more to come! Thanks for following along on our happiness journal! We will meet YOU at HAPPY! This entry was posted in EC&I 832, The Happiness Project on April 17, 2018 by cdegelman. When my class launched our happiness project we were looking at different options for sharing our project. I debated starting a classroom Twitter or Instagram account to share our journey with others. At this time I was looking around on social media to see what may be out there for others already using the happiness project as their name. During this search, I found on Instagram The Happiness Project YQR. I was intrigued so I checked out her page and started following along on Makayla’s happiness project page. You can read Makayla’s blog about her inspiration and journey to starting the happiness project here. Over the past few months, I have had the opportunity to follow her story and see how she has branded #thehappinessprojectyqr. Makayla runs a very successful and positive social media site that helps spread positivity, and guidance to happiness online. Over the past few months that I have been following Makayla’s page, she has had many local Regina guests take over her Instagram to share their successes and their daily rituals to help them be mindful and happy. I have enjoyed following her positive page and learning about her journey to happiness. I feel that Makayla is a great role model to show students how social media can be a platform to spread awareness about your cause in a positive way. Since I teach in a Grade 3/4 classroom I feel that it is a crucial age for students to understand the power of social media and how it can be used positively. I reached out to Makayla to see if she would come into our classroom and help me speak to my class about her happiness project as well as the importance of being kind online. She was so excited that I had reached out and we made plans for her to come into our classroom yesterday! While Makayla was here she shared what her happiness project was all about focusing on daily rituals of gratitude and being kind to others. We also talked about being kind online and students made kindness pledges to pledge to be kind! I updated our classroom happiness blog with all of the activities that we did with Makayla. You can find the update here! I am so grateful for Makayla taking time out of her busy schedule to come and visit us. The power of social media is amazing as a teacher being able to find others in our community that can come in and support our teaching giving our students another perspective. Thanks for checking in! Stay tuned for our reveal this week of how much money we raised for the Make a Wish Foundation! You won’t want to miss this! This entry was posted in The Happiness Project on April 10, 2018 by cdegelman. The last two weeks of #thehappinessproject have been taking time to focus on our minds and working towards understanding that big concept of mindfulness. Two weeks ago the mindfulness guru Trina Markusson came to talk to our students about Mindfulness and different strategies that they can use to help with mindfulness and dealing with big emotions. We read her story Good Morning Sunshine and talked about the different mindfulness strategies that she suggests. Students then made their own Mindfulness wheels with all of the strategies that Trina gave them for their happiness journals. You can find my student’s blog post on the Mindfulness Wheel here. You can find my post including resources for the Mindfulness Wheel here. This past week we have been focusing on our minds as we looked at helpful and unhelpful thoughts and how those impact us. The first lesson we focused on Positive self-talk and the idea that if you plant positive thoughts in your life positive things will happen. Students then had to think of 7-10 positive self-talk mantras that they can use. Students created positive self-talk shields to help protect themselves from negative self-talk. You can find my student’s blog post on Positive Self Talk here. You can find my blog post including resources for Positive Self Talk here. This week we also looked at the idea of taking care of our minds and learning how to focus on the present moment. We watched a video that suggests we need to take ten minutes a day to do absolutely nothing. In this lesson, we looked at the SA TA NA MA Meditation and how it can help people work on being in the present moment. Ten minutes does not seem long but it can be very difficult to stay focused without our minds wandering for ten solid minutes. Using the SA TA NA MA Meditation helps students focus on the present moment of the meditation. You can find my students post on the SA TA NA MA Meditation here. 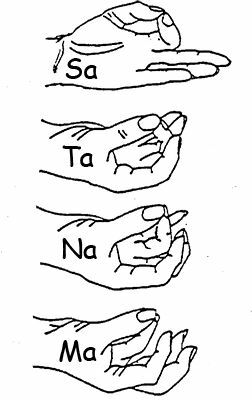 You can find post including resources for SA TA NA MA Meditation lesson here. This entry was posted in The Happiness Project on March 28, 2018 by cdegelman. Giving to Charity Makes us Happy! It has been another exciting and busy week for #thehappinessproject in our classroom. Last week we hit the ground running with our fundraiser for the Make a Wish Foundation Saskatchewan! The students were so excited to begin to raise money for our charity. They are feeling very inspired by the fact that they can work together for a greater cause and be a part of something so great within our province. Children are so caring and giving and this week allowed my students to take on leadership roles in our school in order to inspire others to jump on board with our fundraiser. Small groups of our students went around to each and every classroom to spread awareness in our school about our fundraiser. They worked together to count out and deliver all of the order forms to the classrooms. On Thursday we received all of our pre-order forms and from there we were able to begin to fill our pre-orders with the bracelets that we had made for our fundraiser. We also have other classrooms from other schools around Regina that have been following our blog. They also purchased bracelets so we filled those orders and sent them to their schools! The bracelet sales were a huge success and all the students who purchased bracelets are encouraged to wear them on Tuesday, March 20th for International Day of Happiness. Here are the bracelets our classroom ordered! Another fundraiser our class has planned is on Thursday, March 22nd students in our school can also participate in a mindful day where they can pay $1 to chew gum for the school day. Did you know that chewing gum is mindful? I also had one very caring and generous student who went above and beyond and did her own fundraiser to raise more money for our cause. You can check out Addie’s blog post on our happiness project to read about how she raised $145 for our project! Her blog post can be found here! At our school assembly in April our classroom will be doing a happiness presentation for families and our school as well as at that time we will have the grand total for how much money we raised for the Make a Wish Foundation Saskatchewan! Stay tuned as they have already way surpassed what our original goal was! Feel free to check out our blog here to read up on what we have been learning about this week! My students have been working hard at keeping our blog updated so the classrooms who are following along can continue on with the project. We are so grateful for the classrooms and others who have been following along with our project. Many classrooms and others have left us comments on our blog which has been very exciting for our students. Last week we took time to read all of the comments that have been left on our blog posts. We took time to read each comment and students took time responding to these comments. We talked about why it is important to comment on others work and also how we can use positive comments to encourage others in their work. We also talked about the importance of taking time to reply to comments and why it would be important to take the time to reply to these comments. The students learned so much from this short lesson. We are grateful for the classrooms who have been following along and commenting to encourage our learning. Thank you to all who have taken the time to read and comment on my students learning. It has been another happy week for #thehappinessproject! We have lots of learning left to do so continue checking our blog! I have also reached out to Makayla who runs thehappinessprojectyqr.com. She has branded #thehappinessprojectYQR in Regina and I have been in contact with her about collaborating. I plan to make arrangements to have her come and talk to our class about her journey to happiness as well as her experiences with social media and how she has used social media to spread happiness to all of her followers! I am very excited about this collaboration! Stay tuned to hear what we decide on! Thanks for checking out our update! It has been another busy week and this is only a snippet of what we have been up to! Make sure to browse our blog to see the details! Leave us a comment and let us know you stopped by! What are you doing for International Day of Happiness?! Join us in our pursuit of happiness! This entry was posted in The Happiness Project on March 20, 2018 by cdegelman. Our #thehappiness project as you know is well underway! The excitement continues and I am just blown away by my student’s enthusiasm for this project. This week we focused on feelings for the week. The first lesson we did this week was all about our feelings. You can find Ashton and Deagan’s post Our Feelings here! They did a great job recapping the importance of identifying how different things make us feel and beginning to think about where in our bodies we feel different emotions. We then talked about what it would be like if our body had to carry all of those emotions around and wasn’t able to process them. You can also find my teacher post where I shared the resources I used for the first feelings lesson. You can find my Feelings Lesson 1 here! Here are some highlights from lesson one this week! We continued the week with a second lesson that we began to consider what these emotions do to our bodies and how we need to react to these emotions. You can find Liam and Olivia’s recap of Emotions are like Waves here! They did a great job of sharing how we decide which wolf in our heart to feed. They shared that the one that we feed will be the one that wins. They shared how we need to let emotions come and go like waves. They will come in but with calm attention and care we can release and allow them to leave. You can also find my recap on the lesson as well as the resources that I used to teach this lesson here at Feelings Lesson 2. Here are some highlights from the feelings lesson two! This week was the week that my students launched their Happiness Bracelet campaign. This week they worked sorting all of the information letters into classrooms to prepare to drop them off for the classroom teacher. They also went around to each and every classroom in small groups and talked about our campaign and shared samples of our bracelets and shared that all of the money would be donated to the Make a Wish Foundation Saskatchewan. They were so excited to share this with the students in our school as they have already been creating the bracelets. There was a lot of excitement from other classrooms about our project and many teachers are now reaching out to get more information about our blog which is great! Order forms will be due this week and then we will be filling orders and making any more bracelets that we need to make to fill the orders. We have also have reached out to the classrooms following our project online to invite them to purchase our bracelets as well! Let me know if you would like to order one! We would love to send you one! This weekend I had a parent contact me to let me know that one of my students was doing a bake sale at her church this Sunday with all of the proceeds being donated to our project. I am just so blown away with my students kindness and commitment to this project and to our cause they picked! Watch for updates about her donation hitting our blog this week! This week we will begin to explore ways in which we can self-regulate and deal with these emotions. We will begin to dig deeper into mindfulness and how this helps us deal with big emotions and everyday life. We will be building on the Mindfulness guru Trina Markussons presentation to our school last week! Make sure to check our blog thehappinessprojectdp.wordpress.com for updates this week! This entry was posted in The Happiness Project on March 12, 2018 by cdegelman. This past week was a fabulous week! After lots of preplanning and brainstorming, we finally had the opportunity to launch #thehappiness project in our classroom. There is a TON of energy around this project! It already has been so fun and you know the students are passionate about the project when they cheer when they see #thehappinessproject on our daily schedule. We began our week with each student getting their own happiness journal. Each student got their own journal that they were asked to collage the front of their journals with things that made them happy! I wanted these journals to be personal to them and something that they would cherish and want to do their best work in. Each and every one of their journals are unique and they put so much work into them. Following this lesson, I had two students blog about the lesson on our happiness blog. I showed them how to work the blog and I helped them add in the videos and pictures but otherwise, they were in charge of doing all the writing for the blog! Here is the link to their first blog post titled Day 1 written by Jordyn and Izzy. They were very excited to have been chosen to write about our first activity! The second day of #thehappiness project we started discussing things that make us happy. The idea of this lesson was to brainstorm a list of things that make us happy and talk about how we can pay gratitude to the things that make us happy. We talked about how we can keep these things that make us happy in our heart and when we are feeling sad, mad or upset these things are things that we can do to help us reach happiness again. For this lesson, students brainstormed a list of 20 things that make them happy and then they drew and filled a heart with all of these things. Once again, two students were picked to blog on our happiness blog about our daily learning. Pyatt and Parker did a great job of updating our blog. Check out their post Our Heart Maps! I also updated the blog on the teacher’s page to review what I did for lessons and resources for teachers who are following. I hope to keep the lessons short and sweet with low prep so teachers who are following along in their classrooms can open the blog and easily do these activities on the spot with their students. You can read about the first lessons on the teacher page here! On Wednesday my students shared their happiness project with the entire school at our school assembly. They shared the video that we made with Adobe spark as well as spoke about our mission and our charity. They shared how others can get involved in the journey as well as get involved by donating to our charity. They were so excited to share their project and the response from the staff and students was more than we could have hoped for. I am so excited to watch the rest of this project unfold for them. We also did some more looming and got the order forms ready to send out so we can start taking pre-orders for our happiness bracelets. We will be selling the bracelets for $2 each and all of the proceeds will be going to the Make a Wish Foundation Saskatchewan! Please contact me if you would like to purchase some bracelets to support our cause! We are encouraging everyone to wear their bracelets on March 20th for International Happiness Day! This week is going to be another week for our project! We will be sending out the order forms for our bracelets and we will be promoting sales for that! For this, the students in my classroom will be going to the classrooms in our school and giving a mini-presentation on our happiness project and showing off our bracelets and telling the other students how we want them to all wear them on March 20th to support our project! For the happiness project this week we will be exploring the topic of feelings. We will be exploring the idea that life can be tough and daily we are challenged and we feel many different feelings in a day. We are going to discuss how different feelings make us feel and how our body reacts to different feelings. Stay tuned for my students updating the blog on these ideas! This entry was posted in The Happiness Project on March 5, 2018 by cdegelman.